Join financial professional Cathy DeWitt Dunn and KDAF’s Laila Muhammad as they discuss checking account alternatives in this television interview. Laila Muhammad: Just yesterday we talked about millennials spending more money on experiences than goods. But it turns out a lot of people are focusing on keeping their hard-earned cash. A new study found that more and more middle-class Americans are hoarding money in banks. Total deposits jumped to $10.7 trillion last year. That’s 6.6% more than the year before. That’s according to the Federal Deposit Insurance Corporation. The reason? Incomes are up, the job market is good, people are still hesitant to spend because of the economic uncertainty though. We’re joined now by financial expert, Cathy Dewitt Dun, to explain the effects of this checking account hoarding. I know saving money is a good thing, Cathy, but this may not be the best way, right? Cathy DeWitt Dunn: No, it’s not, because I think if you take a look at like the interest rate environment that we’re in and your money’s just sitting there doing zero. So, a lot of people have a little bit of short term debt, so I suggest they pay that off right away, because interest rates on credit cards are absolutely crazy right now. And you could also do online banking and take a look at banks that have great rates, short term rates, but they don’t really have a front door, you have to go online to be able to access these rates, and it has liquidity. So, there’s a better way to handle your money just versus having it sitting in the checking account. Laila Muhammad: Now, perhaps the person has the money sitting because they have an expense that’s coming up. Let’s say they have to buy a new hot water heater or because they have a trip that’s coming up. Can they still leave it in the checking account or should they still go ahead and still put it somewhere else where they can get more interest in the short term? Cathy DeWitt Dunn: Yeah, I would say just that they put it in a savings account because you can get a higher rate typically than you can in a checking account. Or maybe look at a short-term CD, because then that’s totally liquid, you can get that money later down the road. But having it just sitting in checking just really isn’t working for you. Laila: Should people feel pretty secure right now with the economy in terms of, you know, taking these trips? You said people yesterday were spending more money on experiences than goods. Is it a good time to go ahead and take a little trip and splurge a little bit? Cathy: Absolutely, as long as you’re putting money away for retirement because, you know, later down the road, you’re gonna want to retire. So, I always tell all my clients, “The first day you go to work is the first day you start saving towards your retirement.” So, make sure you take 10%, 15%, put that away, and then you can indulge on yourself and have some great fun this summer. Laila: I was gonna say, you know, how much are we talking when you were saying, “Put away for retirement on your first job.” We had this discussion here, on the show recently, about first jobs and barely getting by. I mean, barely making enough money for rent sometimes. And then you’re thinking, “Should I go ahead and start investing my 401k or should I wait until later?” What advice do you have for some young folks who, perhaps, are watching now, who are just about to start those first jobs? Cathy: Go and jump right into the 401k, especially if there is matching funds. That’s free money. Cathy: And that’s really a great way to start saving because if it’s out of sight, it’s out of mind, and is being payroll deducted. It’s really a great way because you’re not seeing that money and it’s there, and you’re gonna be able to use it later down the road. 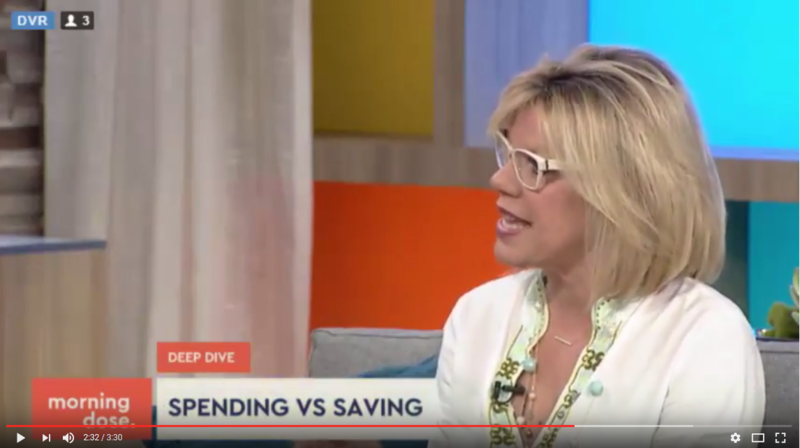 So, make sure you stay within your budget because as we’ve been recently seeing, people are really, now, focusing in on not spending as much money. And it’s really a good feeling to have a 401k plan later down the road. And having that money there just in case of an emergency, as well. Laila: Now, when you’re talking to your clients, what are some of the biggest financial mistakes people are making right now? Cathy: Probably not really taking a look at the interest rates on their credit cards. You know, they sign different may be zero percent financing and now they really forgot to take a look at where they’re currently at. So, take a look at your credit cards, make sure. You can go to bankrate.com and find some great rates and make sure there’s a lot of zero percent interest rates out there if you rollover your current balances. So, look at your credit cards. And, then, make sure you don’t continue on the cycle of accumulating debt on your credit cards. Laila: All right. Cathy Dewitt Dunn, that we love when you’re here visiting us. Cathy DeWitt Dunn: Thank you. Laila Muhammad: Thanks so much for being here on Morning Dose.